I don't usually blog about current affairs or sporting events, it's a pretty easy going over here at the TLWAB headquarters but this weekends sporting events and the series of debates, arguments, comments, feedback both negative and positive have had me thinking all day. 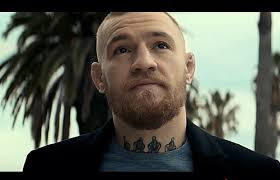 There are so many people waiting to jump on the negative bandwagon when it comes to someone messing up or their downfall and Conor McGregor's loss at the weekend was no exception. Naively prehaps, I didn't actually expect to see such a negative backlash from so called "supporters", I genuinely thought "Y'know what he's done good, win or lose and our country, his supporters will be proud either way" and a lot were. Some though, were sitting in the wings waiting, oh so patiently, for him to lose a fight so that they could attack him straight away. I saw some comments on Facebook that seemed to me to be so rehearsed, that I wouldn't be surprised had the person penned them down ages ago and kept it in a safe place to use when he did go on to lose a fight, totally begrudging comments that prevented them from seeing all of what he's achieved so far. Listen I'm not going to pretend I know anything about this sport or any other sport for that matter, it's not my area, no interest, I listen half heartedly when the OH talks about football but that's it really. The first I ever saw of Conor McGregor was a few females FB friends posting his picture saying how much of a dirty ride he is! What actually drew my attention to him was listening to him one day, I thought "Who the hell is this cocky fella, thinking he's all that a bag of chips?!" but his self confidence, pure positive self belief in what he could achieve won me over and I was impressed. Whether he was going to win whatever fight was coming up, he sure as hell was going to go in there thinking he will and give it his all. I find it so typical of our culture that while the person is flying high and doing great, they are delighted to hold them in high esteem, bask in their glory with them, but when they topple at their top a little, woah...let's stop a second and reign in our support, this guy might not be all he made himself out to be. He's human right?! Allowed to make mistakes like everybody else right?! Yes I think so. Whatever people's opinions are on his technique in the sport, again I'll mention I can't comment on this as I know nothing about the ins and outs, he, to me is what I would call a good sportsman. He took that loss on the chin, there was an awful lot of hype around him and his fight, as there seems to always be but like a true gent, he didn't hide, he came out with a statement on his social media accounts and said he will be back, only stronger this time. Exactly the mindset he should have, when you fall off that horse, the best thing you can do is get back up on it. So my parents told me anyway and it's a motto that's not let me down yet. A lot of people were so quick to forget all that he has done so far since he began his MMA journey, sure he's raking in the money but he doesn't seem to forget where he came from. From what I can see he's back in his hometown, gym, locality every chance he gets. The man oozes positivity, beneath the bravado and pre fight / after fight talk, he's an incredibly positive person and this is a quality that is one of utmost importance in someone as far as I'm concerned. He doesn't let the negativity bring him down, in fact I believe it drives him on. To all those kids, teenagers, men and women who may look up to him, he could be that bit of hope and encouragement they might need to push themselves that bit further. He has achieved great success through nothing but sheer determination and hard work, physically, mentally and emotionally no doubt. He is a man true to his roots, proud to be who he is and where he's from, proud of all that he's achieved but not complacent though his persona may lead you to believe differently. He wants to keep going, win or lose, he's not just going to sit back now he's made a few quid. I'd have sincerely hoped all of that would not have been forgotten in the midst of his loss but sadly it seems to be. People were so quick to jump on his back and try and keep him down, I'm pleased to see they did not succeed. He is a gracious loser and one I'm proud to say hails from my homeland, one that, right now, makes me proud to say I'm Irish. Don't try and take away all that he represents to so many people, hope, dreams, motivation, self belief and a true example of just how far hard work will get you.